Background: From 1939 till 1948 an estimated 300.000 German psychiatric prisoners were systematically murdered. The murders begun with the so called "Aktion T4" (read more about it here) that lasted from 1939 till 1941. Over all at least 275,000 (according to the Nuremberg Trials) were murdered in the time from 1939 till 1945, the end of the Nazi regime. But the killing in the German psychiatric prisons continued by systematic starvation till 1948/49, so another 25.000 victims have to be added to the number of victims given at the Nuremberg trials. 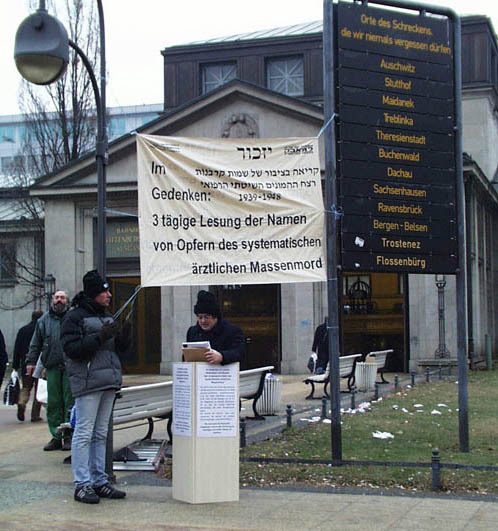 We, 'Landesverband Psychiatrie-Erfahrener Berlin-Brandenburg' & 'Israeli Association Against Psychiatric Assault', requested from the German state archive the only existing complete list of documented and known names of psychiatric prisoners (-many children among them) to read them in public as a commemoration. Among the names was that of Lisa Hempel, the 5 years old sister of Elvira Manthey (read here her testimony in the Russell Tribunal 2001 - listen to her testimony in German) and also the name of 7 years old Valentina Zacchini, whose brutal torture in the name of "science" was filmed by the doctor-Nazis and can be seen in the highly recommended German TV film "Sichten und Vernichten" (search and exterminate) by the historian Ernst Klee. 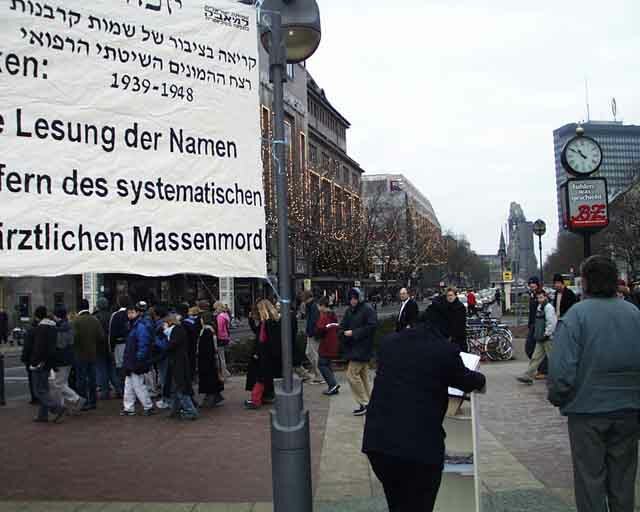 This German-Israeli memorial event is the first public reading 54 years after the end of the systematic medical mass murder of a list with the names of 30161 names of altogether app.. 300.000 murder victims. This list in the only known list of names which is stored in the state archive. The names of the other victims are unknown, theses victims will be not atoned having being committed as perfect murder. Also passers are invited to participate in the reading. 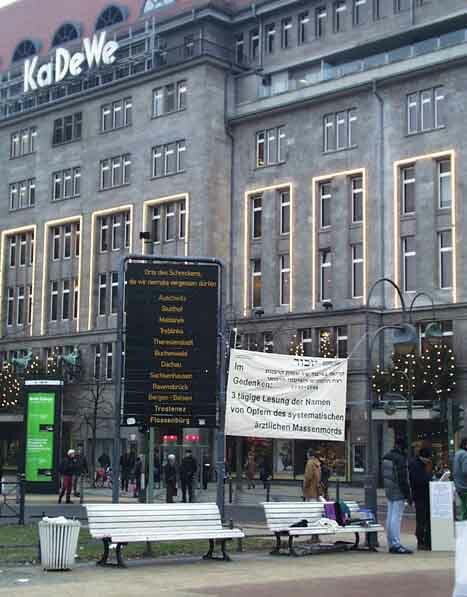 The commemoration took place in one of the most busiest places in Berlin, in front of the KaDeWe (the most luxurious department store of the city) and our banner was tied to the memorial on which are written the names of 12 concentration camps. In Germany there is an un-official policy of hiding the names of the victims from the public domain, and the victims families do not make this mass murder a public issue because of the social shame inherited in the biological medical slander of "mentally ill". Therefore our 3 day names reading is a breakthrough, by reclaiming the human dignity of those so-called "anonymous victims" and by encouraging the German public to take our effort as an example and start investigating their murdered relatives history. During the reading several passers approached us and looked for the names of their relatives which they already suspected were murdered in the psychiatric prisons but only now, with the list, had the proof for that. We instructed them on how to approach the person in charge in the German state archive so they could get a photo-copy of their relative psychiatric file. (one of the passers who approached us identify himself as a former member of parliament. I note this incident to demonstrate how deeply the social shame of the biological medical slander is rooted in all levels of the german society). 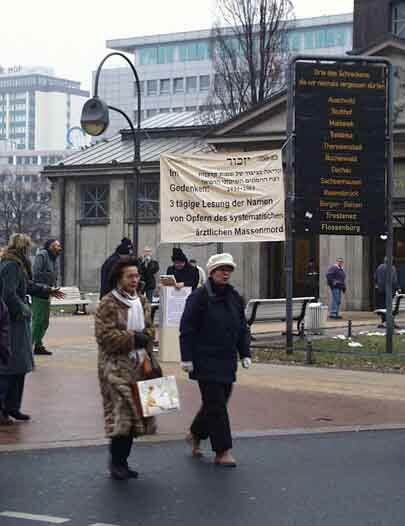 Several of the passers, most of them jews, did read with us the names but unfortunately most of the thousands of people passing by were indifferent. 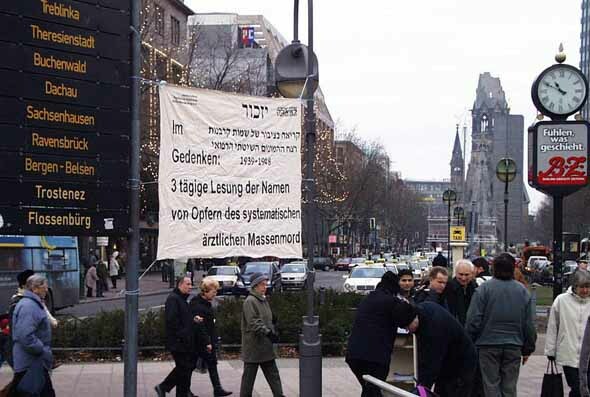 The proposed second stage in this venture, for which we negotiate the permission of the German state archive, is to conduct a similar public reading, under the same banner, in Jerusalem Israel.